To prepare the curry: Combine all ingredients. You can mix them in a container with an electric hand mixer or a blender. Serve the salad with the curry sauce. To prepare the salad: Add the lettuce and watercress to the bottom of a container and pour all remaining vegetables on top, to accentuate the rich colors and textures. Season with salt and pepper. You can toss together a salad using any of the vegetables you have on hand. You can also incorporate fruit and different kinds of seeds. For a lactose-free version of this recipe, omit the Yoplait® Greek plain yogurt and just use the mayonnaise. You could also prepare vinaigrette and add fried shallots and curry. Summer is the perfect season for salads, especially raw ones. The variety of vegetables and fruits available this time of year is amazing and most of what you find is beautiful and ready for eating. 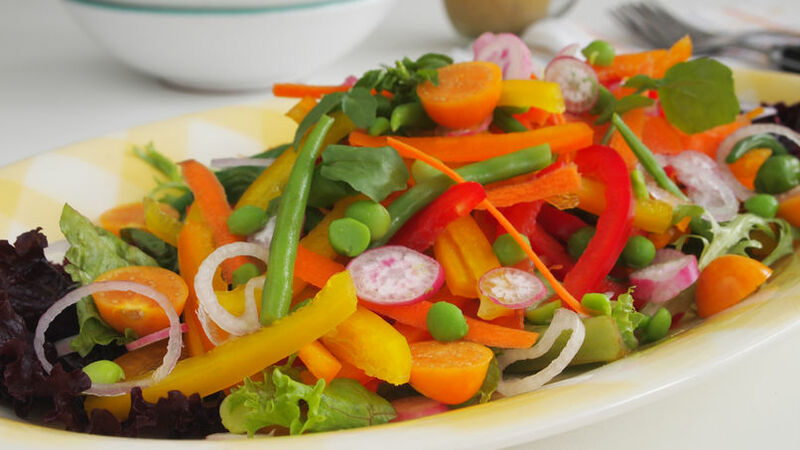 Different colored bell peppers form the base of this salad, accompanied with other seasonal veggies, some raw and others steamed, but feel free to use whatever you have on hand or your favorites. Use this recipe as a general guide, and then add or remove to satisfy your craving. This salad is perfect for a light, refreshing beach lunch, paired with fried fish, grilled chicken or any other protein. If you’re vegan, you could also add marinated tofu in some soy sauce. Toss in pineapple or grapes to make this summer-veggie salad even more delicious.